Supplied with "invisible" hanging wire so you can hang your crystal in your window straight away. Feng Shui originated in China over 3,000 years ago. It's primary aim is to improve every aspect of life, including wealth, relationships, health and happiness by creating balance and harmony in the environment. Feng Shui means wind and water. Wind (feng) represents health and water (shui) represents wealth - not only in a financial sense but also wealth of mind, body and spirit. Turn ordinary sunlight into a shimmer of rainbow magic by hanging this multi-faceted crystal sphere in a sunny window. Hang a Rainbow Crystal in your window to energise your room and activate positive chi (positive energy) and to create beautiful rainbows as the sun shines through the crystal. This Crystal is multifaceted to reflect and refract light and the crystal will scatter light in beautiful patterns as the sun shines through it. Crystals are a very popular Feng Shui cure for stagnation in any area of your life. Use a Crystal to energise and enhance any area of your home. Use a Crystal to break up unwanted or confusing energies. This has to be the easiest and most beautiful (and least expensive) way to energise your home and break up unwanted or confusing energies. 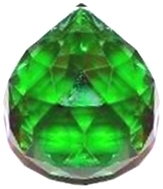 This top quality Crystal is made from optically flawless Austrian Lead Crystal.